Inspiration: Drawing on her BFA in printmaking, Naomi used the raw quality of intaglio etchings as inspiration for her prints. 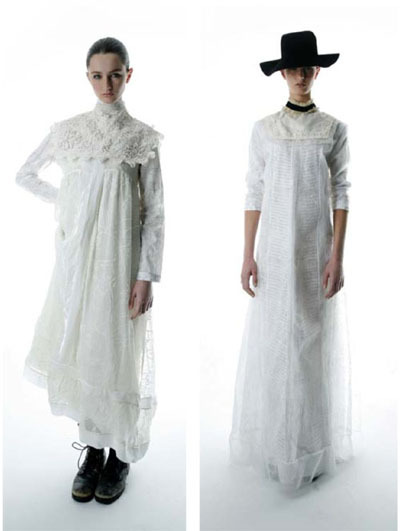 Her prairie silhouette draws from ’70s Laura Ashley, 19th century undergarments, and her childhood growing up on a hobby farm. In partnership with BFA Technical Design students: Lindsey Gong, Jackie Nguyen, Kendy Morton and I-Wen Chen who made the patterns and sewed the garments.